Connect 4 is a strategy game, the goal is to form a line (horizontal, vertical or diagonal) of at least 4 pieces of your color in a grid of 6 rows and 7 columns. 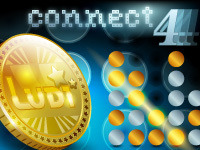 Ludi's Connect 4 Max Power adds a twist, The goal is the same but out Max version is played in a grid of 9 rows and 7 columns. To win the game of Connect 4 you must create a line of 4 pieces of your own color in a grid with 6 rows and 7 columns. Two players take turns placing a piece in the column of their choice. The piece drops the bottom of this column. The first to create a line (horizontal, vertical or diagonal) of at least four pieces of their color is the winner. For Max Connect 4, the rules are exactly the same, the only difference being the larger playing grid of 9 rows and 7 columns. The games may end without a winner if the grid is completely filled without either player creating a line of 4. At beginning of the game, it is best to place your chips in the central columns to form many lines in various directions.